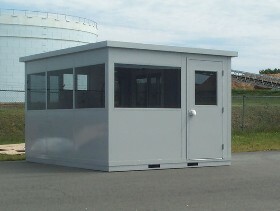 Our modular shelters and guard shacks are fully assembled, ready to be installed on your supplied pad. They are engineered to withstand extreme weather conditions. 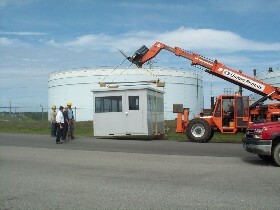 All our shelters and guard shacks are steel-coated with a rust-inhibitive epoxy primer and an acrylic modified alkyd topcoat. 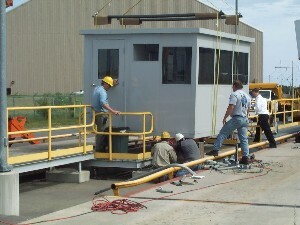 Our exterior shelters and guard shacks are fully assembled, ready to be installed on your supplied concrete pad or mounted on trailers. They are engineered to withstand extreme weather conditions. 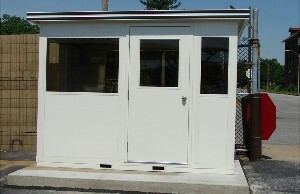 All our shelters and guard shacks are steel-coated with a rush-inhibitive epoxy primer and an acrylic modified alkyd topcoat. 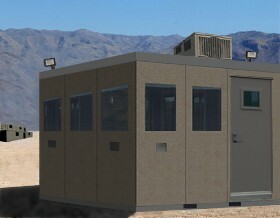 Ballistic and blast rated guard shacks are steel welded or ICB panel clad. Standard widths of 4', 6' and 8' and standard lengths of 6', 8', 10' and 12'. The standard height is 7'-3". 6" x 6" x 3/8" base plate with prepunched holes. 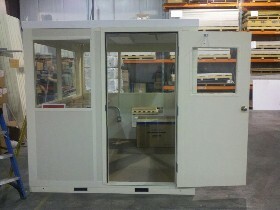 Extruded aluminum window frames come pre-caulked and finished with poly coating. Roof constructed of sandwich panel of exterior grade oriented strand board, rigid polystyrene and vinyl covered hardboard.